Microsoft is in the final stages of launching a cross-platform smartwatch to track a user’s heart rate, according to Forbes. The biggest draw of the wearable device is a battery life of more than two days with regular use, approximately double the battery life of the Samsung Galaxy Gear and Moto 360 wearables. 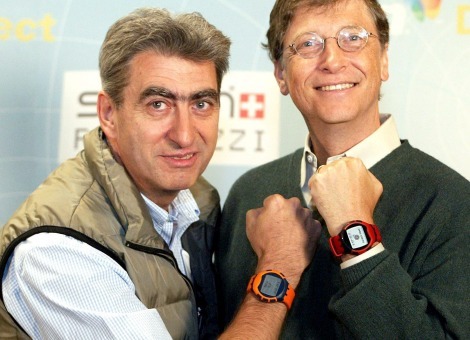 The smartwatch will sync with Android, iOS and Windows Phone devices. A name or cost of the wearable has not yet been released, but according to Forbes the smartwatch will launch in the next several weeks and be available in stores in time for the holiday shopping season. IBM announced it no longer supports its 2015 earnings forecast, spurring a steep decline in its stock. IBM share prices have dropped as much as 8.4% since CEO Ginni Rometty abandoned previous CEO Sam Palmisano’s pledge to reach adjusted profit of $20 a share by 2015 on a conference call this morning. At the same time, IBM announced it has agreed to a deal with semiconductor company GlobalFoundries to take over the company’s struggling chip manufacturing division, paying GlobalFoundries $1.5 billion over three years to assume control of the business. IBM will provide updated earnings projections in January. The Free Software Foundation and the GNU Project have announced the opening of nominations for the 17th annual Free Software Awards, which includes the Award for Advancement of Free Software and the Award for Projects of Social Benefit. The Award for Advancement of Free Software recognizes an individual who has contributed to the progress and development of free software. The Award for Social Benefit recognizes a project or team responsible for applying free software or the ideas of free software in a project that benefits society in other aspects of life. Previous award winners and award committee members are not eligible for nomination. Nominations must be submitted on or before Sunday, Nov. 16, 2014 at 23:59 UTC. More information is available here.